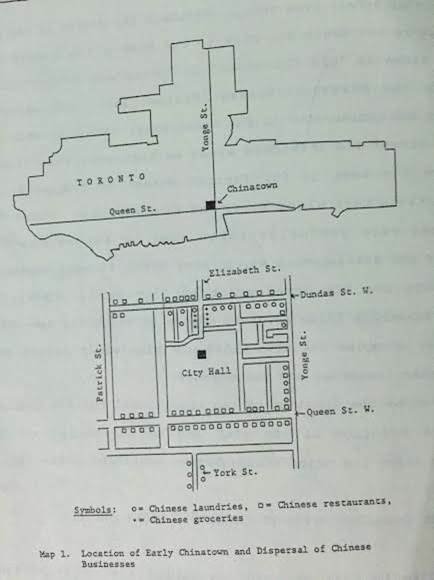 Source: “Chinese History in Toronto” 1toronto.ca. Toronto Archives. N.d. Web. 7 Feb 2015. 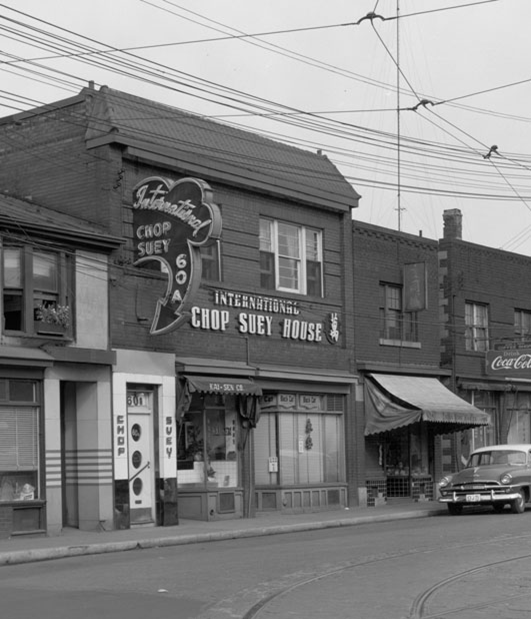 Due to the increasing number of Chinese immigrants coming to Toronto, Chinatown became a popular residential and commercial centre for many businesses including restaurants, laundries, and grocery stores. These businesses were easy to start up, only required a small monetary investment, and also allowed the Chinese to create jobs for themselves instead of having to go out and look for work. 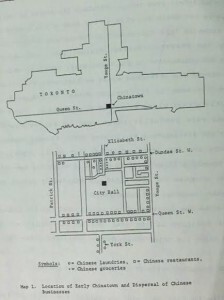 Since downtown Toronto was such a popular location, many restaurants were successful, which allowed people to get good quality food at a decent price. However, restaurants cost more to invest in than laundries but the profit was much greater which usually evened out costs. 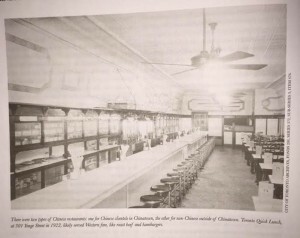 The Chinese also lived in the restaurants they worked in, which helped minimize their costs. City of Toronto Archives, Fonds 200, Series 372, Sub-Series 3, Item 476. 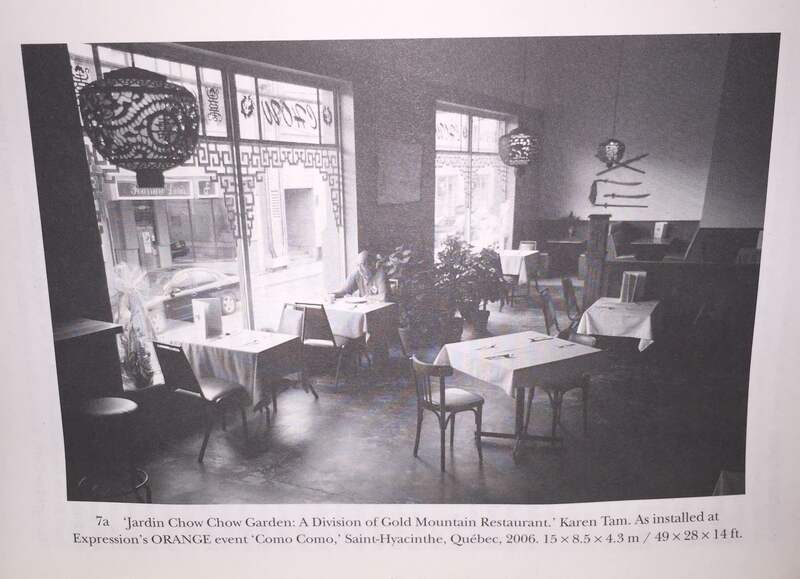 Source: 7a ‘Jardin Chow Chow Garden: A Division of Gold Mountain Restaurant.’ Karen Tam. As installed at Expression’s ORANGE event ‘Como Como,’ Saint-Hyacinthe, Quebec, 2006. 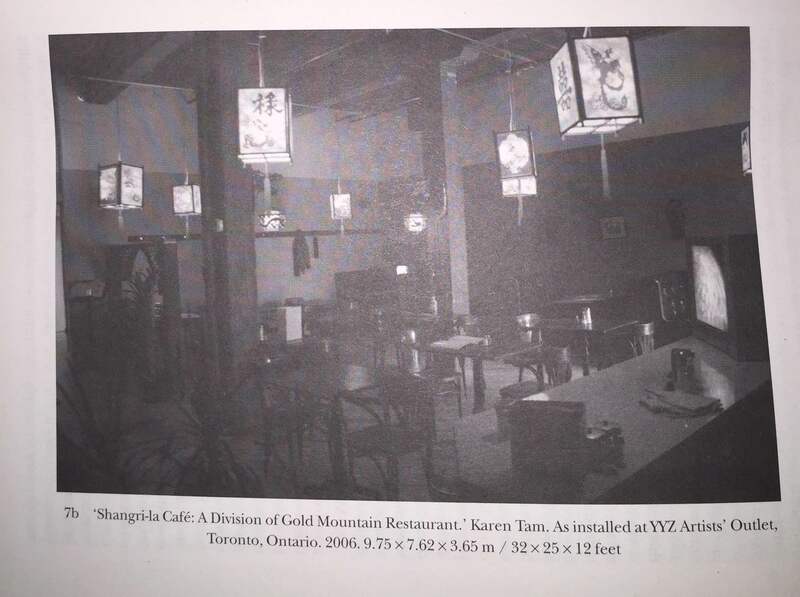 15 x 8.5 x 4.3 m / 49 x 28 x 14 ft.
7b ‘Shangri-la Cafe: A Division of Gold Mountain Restaurant.’ Karen Tam. As installed at YYZ Artists’ Outlet, Toronto, Ontario. 2006. 9.75 x 7.62 x 3.65 m / 32 x 25 x 12 feet. 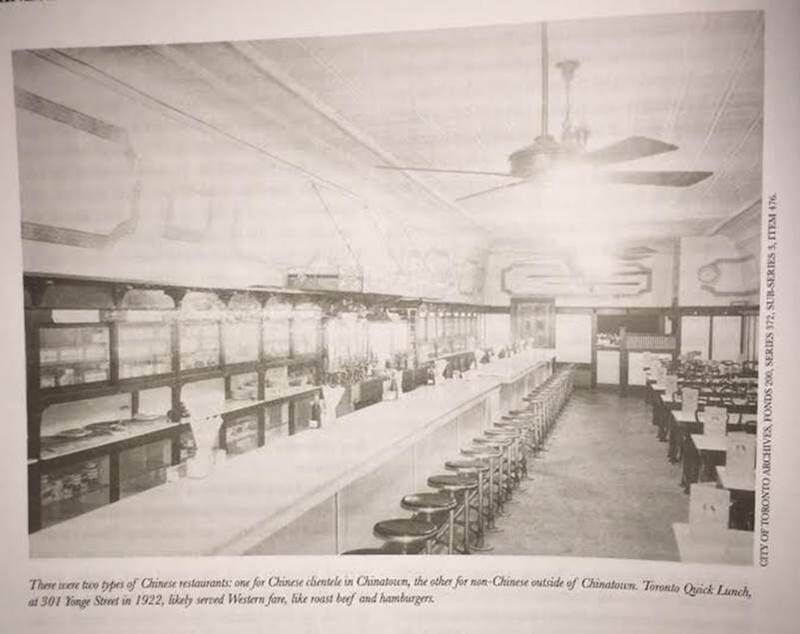 In 1901, the first Chinese restaurant to open was Sing Tom’s restaurant; however it didn’t last very long and was replaced by Kong Yee Teas in 1902. 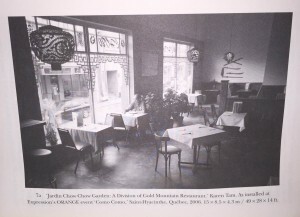 Two other popular restaurants that were specially known for their Jewish and Chinese clientele were Hung Fah Low and Jung Wah. 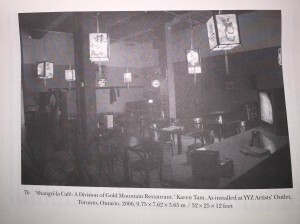 The more restaurants that opened, the more Canadians feared that by allowing white women to work for the Chinese they would ultimately sell them into slavery. 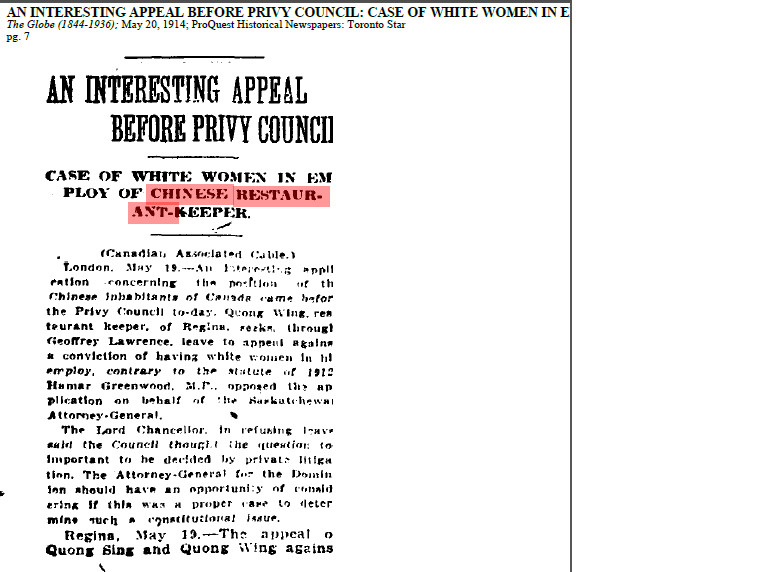 In 1908 the Board of Police Commissioners began to refuse licenses to restaurants that employed white women. 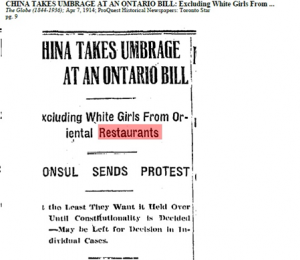 This sparked a lot of outrage from the Chinese however even though it was prohibited to employ white women in 1914 there were still as many as 126 white women employed in Chinese restaurants in Toronto. 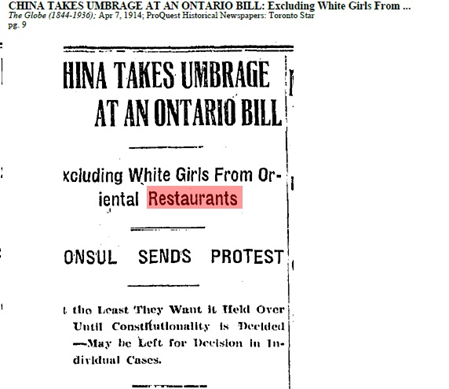 “CHINA TAKES UMBRAGE AT AN ONTARIO BILL.” The Globe (1844-1936): 9. Apr 07 1914. ProQuest. Web. 4 Apr. 2015 . 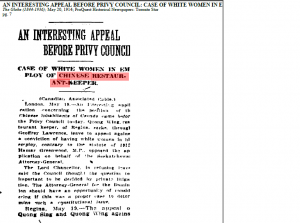 “AN INTERESTING APPEAL BEFORE PRIVY COUNCIL.” The Globe (1844-1936): 7. May 20 1914. ProQuest. Web. 30 March. 2015 . Although the growth of Chinese restaurants was gradual and slow, today they are an integral part of Chinatown’s economy and culture. Many restaurants not only serve traditional Chinese food but some dishes have also been adapted to suit people’s tastes in the West. Dishes like chop suey and dim sum are still popular among many customers that visit restaurants. 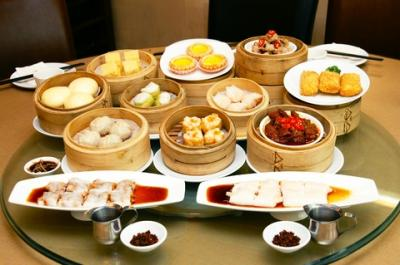 A Dim Sum Spread. Retrieved from Toronto Chinatown Photos. Info. Web. March 30. Zuha Ziaee is a second year English at Ryerson University in Toronto. She has a passion for writing and research and was asked to focus on an aspect of Chinatown as part of her final research project for ENG390: Open Topics in Experiential Learning. Chan, Arlene. 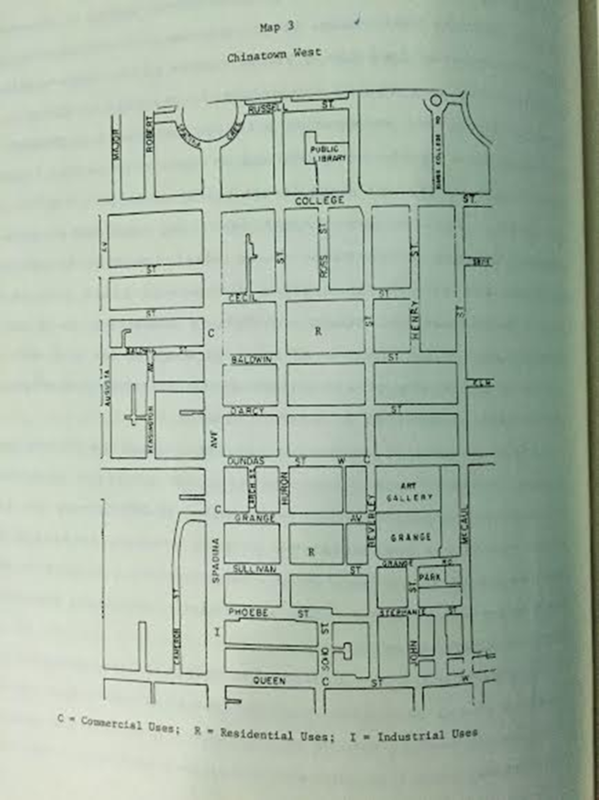 The Chinese in Toronto from 1878: From Outside to Inside the Circle. Toronto: Dundurn Natural Heritage, 2011. Print. “Chinese History in Toronto” 1toronto.ca. 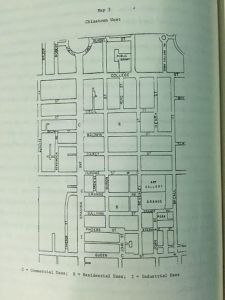 Toronto Archives. N.d. Web. 30 March 2015. Cho, Lily. Eating Chinese: Culture on the Menu in Small Town Canada. University of Toronto Press, 2010. Print. Thomspson, Richard. 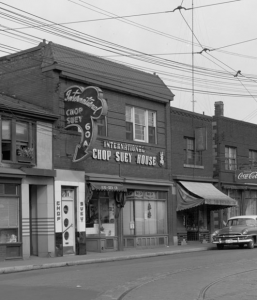 Toronto’s Chinatown: The Changing Social Organization of an Ethnic Community. New York AMS Press Inc, 1989. Print. Toronto Chinatown Photos. toronto-chinatown.info. N.d. Web. 2 April. 2015.